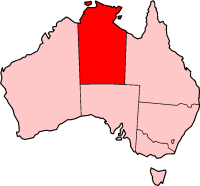 The Northern Territory is a territory of Australia. The capital city is Darwin. Other large towns in the Territory include Alice Springs, Katherine and Tenant Creek. The Northern Territory has large areas of desert. It has many important places such as Uluru, or Ayers Rock. The rock is sacred to the native people. Kakadu National Park is a World Heritage area. It has been lived in for more than 40,000 years. There are cave paintings, rock carvings and archaeological sites. These show the skills and way of life of the people who have lived there. The park has different ecosystems, including tidal flats, floodplains, lowlands and rocky gorges. It provides a place to live for a wide range of rare types of plants and animals. The floral emblem of the Northern Territory is Sturt's Desert Rose, Gossypium sturtianum. The flower is also featured on the Territory's flag. It was named after explorer Charles Sturt who found the plant in creeks near the site of Broken Hill, New South Wales in 1844. The Fauna emblem is the Red Kangaroo. Wikimedia Commons has media related to Northern Territory. ↑ "Kakdu World Heritage Area". Unesco. Retrieved 2008-12-13. ↑ "Floral Emblem of Northern Territory". Australian National Botanic Gardens. Retrieved 2008-12-13. This page was last changed on 21 February 2018, at 08:46.